Mold can reek havoc on a home and can be greatly unhealthy for your family. The best way to get rid of mold is through the Surface Management and Treatment System. Surface Management and Treatment System (S.M.T.S.) is a powerful bactericide, fungicide, virucide, and disinfectant. 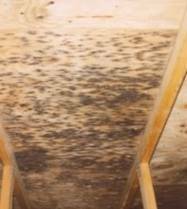 It is used in residential, industrial, institutional, and commercial establishments for treating mold. S.M.T.S. is a unique system, designed in two parts to eliminate bacteria, and prevent their return to treated areas. The system kills the bacteria, cleans the area, and consists of elements highly beneficial to surfaces. It is also a multi-purpose, anti-microbial solution, based in quaternary ammonium salts. This EPA registered cleaning system serves as a bactericide, fungicide, virucide, disinfectant, as well as a mildew stat and deodorizer. Its one-of-a-kind ingredients dramatically enhance the roof system's capacity to fight mold, and are a safe, effective, and affordable solution to mold prevention. Utilized on porous and non-porous surfaces, and within the Preventative Maintenance spectrum. The best way to protect your home or business against mold, bacteria, fungus, and the harmful effects of water, including moisture and intrusion. The treatment system will not harm the color or quality of your surface. You can even paint over treated areas without worrying about degrading their appearance. Ice dams can be a serious problems for people who live in climates with cold weather. Below are some frequently asked questions about ice dams and how to handle them. 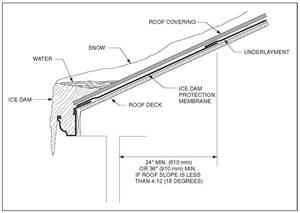 An ice dam is formed on a roof as a result of weather conditions. This build up of ice prevents water from flowing down off the roof properly. The “ice dam” pushes the water back up the roof slope, beneath the shingles, and can lead to interior leaks if pushed past the 7 inch shingle overlap. The roofing shingles are installed at the bottom of the roof slope, and work their way up. As they go up the roof slope, they overlap each other by 7", and are designed to shed water running down the roof slope. An ice dam can prohibit the natural flow of water down the slope, by reversing its course and penetrating the shingles. This can lead to costly repairs if not treated in a timely manner. When do ice dams form? Ice dams usually form during the winter season. They can occur at any time during this season, if cold weather conditions persist. A snow fall with melting temperatures during the day, along with freezing temperatures at night, can cause ice to form over the roof. An ice storm is particularly dangerous, as it can blanket the entire roof with ice, and cause tremendous problems. Can ice dams damage my roof? Ice dams usually do not damage a roof system. Once the ice has melted, or is removed, the shingles will continue to shed the flow of water down the slope. Are ice dams the result of faulty roofing? No. A roofer is not responsible for ice building up on the roof, and is beyond his control. This is purely an act of nature, formed by cold weather conditions and unpredictable temperatures. Does insurance cover ice dams? Yes. Ice dams are covered within insurance policies, as they are created by weather conditions beyond the home owner's control. The damage inflicted on the roof is usually less than the deductible itself. Do certain roofs attract ice dams more than others? Yes. Roofs with a low slope are more susceptible to water flowing back up, and seeping through shingles. A subpar or poorly designed roof can also accumulate ice or snow, and present unfavorable conditions. Can we prevent ice dams? If proper attic ventilation and insulation is present, this may help to prevent ice dams. Snow can be removed from areas of the roof vulnerable to thawing/freezing, and before an ice dam has a chance to form. You can also run low voltage wires to prevent ice formation, along the bottom of the roof slope. If we cant prevent them from occurring, can we prevent them from leaking? yes. there are roofing materials that are designed to prevent ice dams from leaking inside interior of home or building. For more information, and all inquiries, please contact us today. Thank you for visiting our website. We hope to hear from you, and look forward to fulfilling your roofing and home improvement needs.